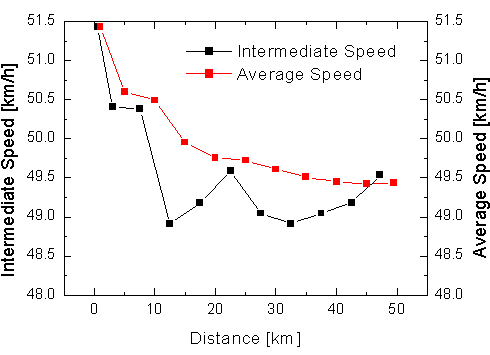 One can use the split times to plot the average speed at a given distance or the intermediate speed. Merckx had started incredibly fast, since he wanted to break Ole Ritter’s 5km, 10 km and 20 km records (Remark: Ritter had set his records on a special ride separate from his Hour attempt!). His first km in 1.10 (which gives 51.43 km/h) is still the record mark for the first kilometer in an hour record attempt (Rominger in 1994 and Boardman 1996 started also faster than 1.11). His trainer urged him to slow down after 10 km. The graph shows that probably he went too slow and then increased his speed again, finally settling to a quite stable pace from km 25 to the end. At the end of the attempt he had enough power to increase his speed a bit. It is quite remarkable that due to his fast first kilometer his intermediate speed was well below the average speed for the rest of the attempt.